The EU Ecomanagement and Audit Scheme (EMAS) is an environmental management scheme that aims to improve the environmental performance of organisations by committing them to evaluating and reducing their negative environmental impacts. It is a voluntary framework that provides the basis for a published environmental report and it aims to recognise and reward those organisations that go beyond minimum legal compliance and continuously improve their environmental performance. EMAS incorporates ISO14001 (see ISO9000 Series) and is externally evaluated. Once accredited, participants can publicise their participation in the scheme through use of the EMAS logo. Conduct an environmental review of all its activities and assess them against existing environmental laws. Establish an environmental management system setting out its environment objectives and the means to achieve these objectives. Carry out an internal environmental audit assessing the management system in place and compliance with relevant environmental regulatory requirements. Provide a statement outlining its environmental policy, programme and management system, and summarising its environmental performance with the results achieved and the steps necessary for future improvements. The core of EMAS is a ‘continuous improvement cycle’ or the plan-do-check-act process. The elements of this circle are presented in Figure 4. The environmental review is an initial comprehensive analysis of the environmental problems caused by an organisation’s activities. The outcome is a report that includes hard data about consumption of raw materials and energy and the production of wastes and emissions; information on the indirect environmental impacts of the organisation’s activities; and an outline of the management structures in place to deal with these impacts. The purpose of the initial review is to identify the most significant environmental impacts – and thereby identify possible priorities to be set in the environmental programme – and to lay down a benchmark to measure future success in reducing these impacts. The formulation of an environmental policy, reflecting top management’s commitment to continuous improvement in environmental performance inside the legal framework is the first visible step of the process. The environmental policy is a document that describes the organisation’s overall aims and principles of action with respect to the environment. Developed at the highest managerial level, the environmental policy is intended to be revised periodically. It should contain at least two central elements: compliance with relevant environmental regulations and a commitment to continuous improvement. The environmental programme translates the general objectives and targets established in the environmental policy into specific targets, determining concrete measures, timeframes, responsibilities, and the resources necessary in order to meet them. 1 The measures laid out in an environmental programme can be of a technical and/or organisational nature. All of the company’s activities – from top management to the lower levels – should be involved in these measures. 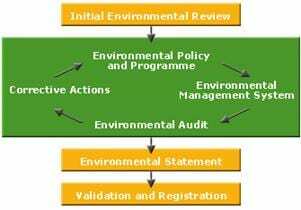 To ensure the successful implementation of the environmental programme, an organisation is required to establish operating procedures and controls, or an environmental management system. Apart from the environmental impact of production activities and housekeeping activities (property management, procurement, energy consumption, waste production and management), an EMAS-registered environmental management system has to include the indirect environmental impacts of an organisation’s activities, products or services. 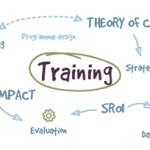 A description of the organisation, its structure and its activities, products and services. An assessment of all the significant direct and indirect environmental issues. A summary of year-by-year figures on pollution emissions, waste generation, consumption of raw material, energy and water, and noise. A presentation of the organisation’s environmental policy, programmes and management system. The deadline for the next statement. The name and accreditation number of the environmental verifier and the date of validation. When the environmental management system has been implemented and the environmental statement has been prepared, the organisation must have them validated by an independent accredited verifier: an independent external party that examines the organisation’s environmental policy, management system, audit procedure(s) and environmental statement to ensure that they meet EMAS requirements. If the verifier is satisfied that the requirements are met, he or she validates the information contained in the company’s environmental statement. Once the environmental statement has been verified, the organisation then sends its validated statement to the EMAS National Competent Body for registration.2 The organisation is then listed in the register of EMAS organisations and has the right to use the EMAS logo. Organisations are required to update their environmental statement annually, although in exceptional circumstances, for example, small organisations, this renewal period can be extended with the agreement of the verifier, normally up to three years. Commit to continual improvement of their environmental performance. Demonstrate an open dialogue with all stakeholders. Extend employee involvement to the process of continually improving the organisation’s environmental performance. The EMAS logo can help to promote an organisation’s active involvement in environmental issues to potential customers or service users. EMAS helps organisations reduce waste, energy use and resources that can help to reduce costs. EMAS can provide a method for communicating environmental accountability to stakeholders including funders through periodic statements that have been externally validated by an independent verifier. It seeks to instill continuous improvement. Involving employees is central to EMAS, and it can be a good way of motivating action towards environmental improvement. EMAS has the potential to be expensive due to the cost of verification, training that may be required, and registration. Conformity to EMAS may be complicated or labour intensive for some small social enterprises, particularly if new to environmental management systems. In such cases, an organisation might begin with a tool, such as Eco-mapping or the SME Toolkit, as a basis for implementing EMAS at a later date. Though it has been applied in a variety of organisations, in the public and private sectors, third sector examples are limited. EMAS is open to all types of organisations from all economic sectors. Small or large socially enterprising organisations, local authorities, and multi-national companies can all participate in EMAS. EMAS can be applied to the whole of an organisation or to specific sites. Over 4000 organisations have implemented EMAS at sites across the EU. In the UK, EMAS had been used by 69 organisations, many of them local authorities. Organisations will need to make sure that management levels are involved and support the EMAS implementation project. The EMAS Small Organisation Toolkit suggests that organisations find and name a co-ordinator to lead on the project, to make it effective and to promote it internally. EMAS needs time, knowledge, human resources and potentially external advice. External assistance can be useful for carrying out the steps of the system, such as the initial environmental review and identification of the significant environmental aspects of your company’s activities and legal requirements. The cost of implementing EMAS will vary depending upon the organisation and size. Though the guidance notes for EMAS are free, the main costs relate mainly to those for the external verifier, registration fees and implementation costs. There are a number of web-based support tools available. The EMAS EU website is the main portal for information and support. This contains guidance on implementing EMAS, leaflets, statistics, case studies and offers an ability to view and compare other organisations’ environmental performance statements. The website also has details of the EMAS Helpdesk that can be contacted with all queries regarding the system. EMAS also produces publications, such as the Energy efficiency toolkit for small and Medium-sized enterprises, that can be used as a stepping stone to full EMAS registration. The EMAS UK website has a list of verifiers in the UK. Verifiers are environmental auditors who have been accredited by the Government-appointed United Kingdom Accreditation Service (UKAS), to ensure that they are competent. EMAS and The International Network for Environmental Management (INEM) produce a toolkit for small organisations that may be particularly useful for socially enterprising organisations: http://www.inem.org. This provides a web-based guide to the system and extensive information on how to implement EMAS, as well as further information on financial support, case studies and other resources. The EMAS competent body in the UK is the Institute of Environmental Management and Assessment(IEMA). Its website www.emas.org.uk also contains guidance in the form of reports and notes for verification in a UK context. EMAS emerged in 1993 as a framework open to industrial sector companies operating in the European Union and the European Economic Area (EEA). In March 2001, the Council and the European Parliament adopted the revised EMAS regulation that strengthens and extends the scope of the scheme. This includes the extension of the scope of EMAS to all sectors of economic activity, the EMAS logo and incorporation of ISO 14001:2004. A revised protocol will be in effect from 2010. 1 EMAS objectives are overall goals; targets are a series of stepping-stones toward these goals. Both elements should be measurable wherever possible. 3 This evaluation is based on a survey of 125 Belgian companies in the year 2000.